Oh pizza. PIZZA. You're such a temptress, pizza. I've been through them all - the crazy chemical miracles that are on the market to help those of us aspiring to be vegan to calm our cravings. But there's the aftertastes - the freaky textures - the plastic-coated tongue - nothing does it for me. The only thing that takes a little of the edge off? Cashew cheese. I know I've harped on the stuff before, many a time, but you guys should know - my love doth not lessen. CC hits all the importants - crisps under the broiler, has the all important indulgent, fatty flavor and texture, and it's extremely customizable. Making a tex-mex pie? Stick half a jalapeno, a handful of cilantro, and use lime juice rather than lemon for tang whislt pureeing the nuts. The above pie? 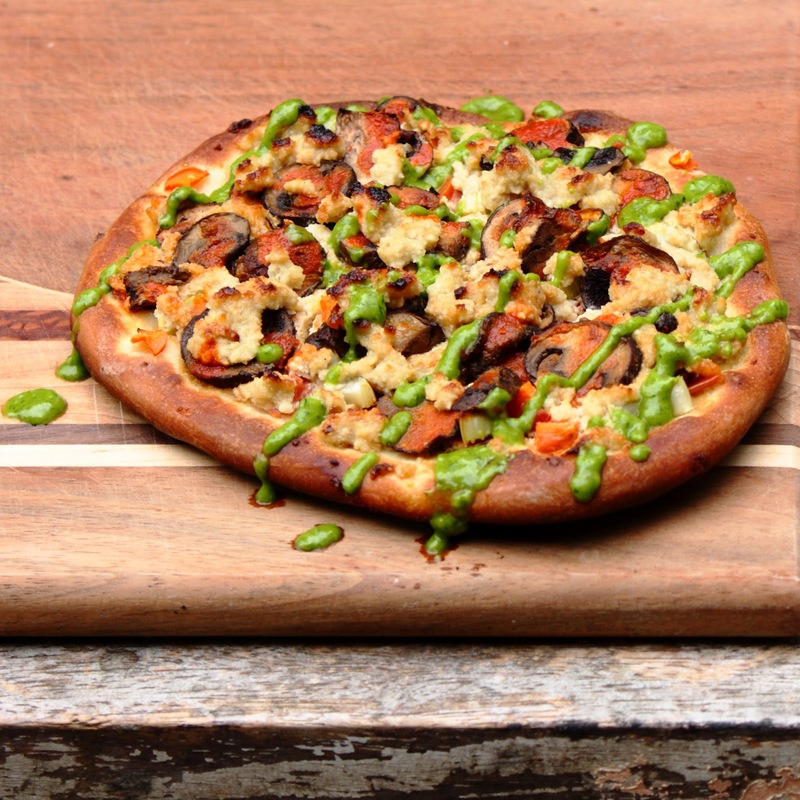 Buffalo mushroom with carrots, celery, roasted tomato, topped with jalapeno/parsley puree. HOT POTATO and extremely delish. Details below. Soak 2/3 cup raw cashews in hot water, just enough to cover, for 20 minutes. Drain half the water off and toss them into the blender, along with the juice of one lemon, 2 tablespoons nutritional yeast, 1 teaspoon salt, 3 cloves garlic (minced) and pulse until the cashews start to break down. You'll most likely need to get a scraper out to help the puree process along. Chunky texture is good - but not too chunky. If your cheese ends up a little wet - transfer to a small baking sheet and bake in a 350f oven for 10-15, scraping often, until it dries out a bit. Meanwhile, roast your tomatoes and mushrooms: toss the sliced Romas with a little olive oil, lay out on a baking sheet, and throw them in a 400f oven for 20 minutes or so. Just enough to char them a tiny bit, and dry them out. Same with the mushrooms - you want them to release a little liquid and absorb your hot sauce. Remove veggies and turn the heat to 450f. Roll or throw your pizza dough into a 12-14 inch round. Brush it with olive oil. Spread a good heaping tablespoon of cheese over the dough, spreading with a spoon or your fingers. This is the glue layer - it'll help keep your toppings on your pizza. Lay the tomatoes over the pie, attempting not to overlap. Then scatter carrots and celery. Then mushrooms. Now, with your fingers, grab half-handfuls of cashew cheese and gently "throw" it at your pizza, covering the pie as evenly as possible. I love this technique as it allows the cheese to make peaks that brown very nicely as the pie bakes. Toss that sucker in your preheated oven and bake 10-12, until crust is golden brown and the cashew cheese is starting to toast. While the pie is baking, rinse your blender out and make the jalapeno puree - add all ingredients to your blender and whirr until combined, adding just enough water to make things go smoothly. Remove pizza from oven. Transfer puree to a squirt bottle. Drizzle pizza with puree, slice, and serve. please send this to me! i love your photos and recipes! Man, I got to get one of those industrial freeze-dryers. It'd be all BTTF 2 - hydrate level 4, please. Cashew cheese is killer - it definitely makes all the difference on a vegan pizza. Looks like I know what I'm making for dinner tonight! See, I knew I wasn't alone - homemade cashew cheese trumps Daiya ANY day. God, this sounds SERIOUSLY amazing. Love the bright green drizzle, and I bought a ton of cashews today so YEAH. This. Believe it or not, but I've never had cashew cheese on pizza. Never. But thanks to you, after this weekend I'm pretty sure that statement will no longer be true. Damn that looks good! Mmmmmm, looks good enough to eat! I'm pretty excited about trying it out!!! This is my favorite pizza of all time. Props. Oatmealwithafork.com for vegan quinoa crust.